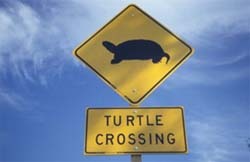 You are here: Home / Environment & Conservation / Why did the turtle cross the road? Turtles will be making their slow march across roads, as they look for a place to nest. Turtles leave the water around this time each year, as they look for a place to lay their eggs on well drained soils. That search often leads turtles to cross roadways across the state, and the DNR is urging motorists to be on the lookout for them this spring. Bob Hay of the DNR Bureau of Endangered Resources says road losses can have a huge impact on turtle populations. He says some several species of turtles can take 15-20 years to reach maturity, so the loss of a breeding female can set back the population for years. Five of Wisconsin&apos;s 11 turtle species are experiencing significant population declines. Hay says if it is safe to do so, you can help the turtle across the road in the direction it was headed.